Whether you have your own garden or are benefiting from the bounty of zucchinis from generous friends, are you wondering what to do with them all? 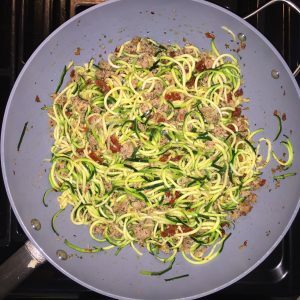 Making “zoodles” is the perfect low-carb idea for that excess zucchini! How do you make zoodles? You can buy a zucchini spiralizer on Amazon. Occasionally I will find the plastic crank type at Marshalls or TJ Maxx for around $12. My plastic crank type works great on zucchinis, but not on harder vegetables like carrots and sweet potatoes. You can also use a vegetable peeler and make fettuccine sized zoodles. Here is a great primer on making zucchini noodles with different tools and how to cook them. Toss zucchini with your favorite pasta sauces – marinara, meat sauce, even pesto. 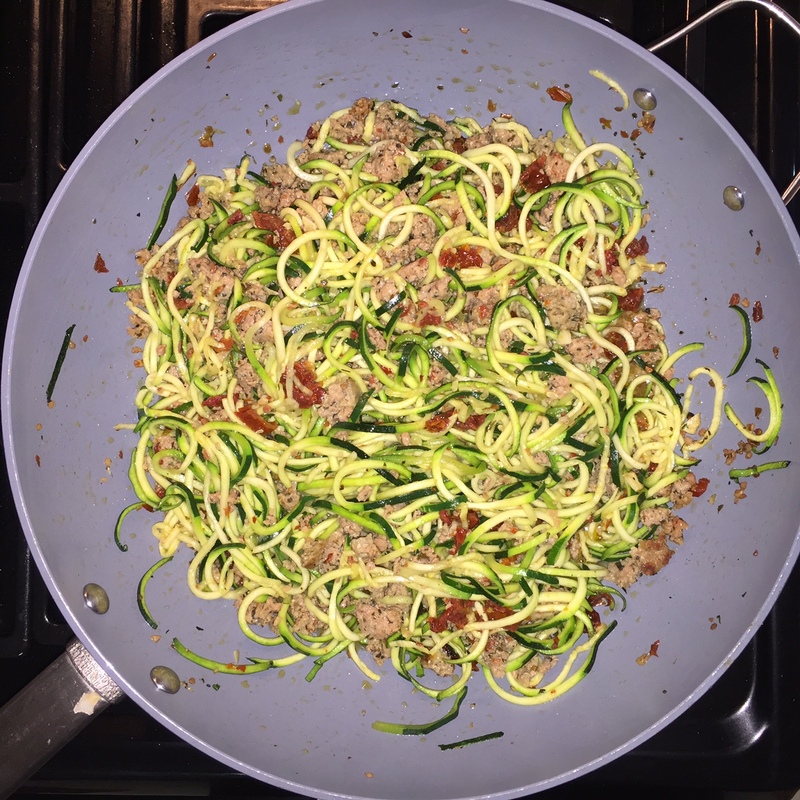 I sauté the zoodles in a pan with olive oil until the noodles are soft before adding the sauce. Another way to soften them is to spread out on a cookie sheet with sides and bake in the oven until they are the desired consistency. Personally, I think the pan on the stove is easiest. My creation below is a combo of garlic, sun dried tomatoes, crumbled sausage, and fresh basil. I do everything in the one pan. A wok type pan with high sides works best. The zucchini will provide some moisture as it cooks which is good for drier stir fry type concoctions like this one. Fresh chopped tomatoes, colored bell peppers, eggplant, and mushrooms are also great additions. If you want to hide the ‘green’ skin from kids, peel outer skin first before spiralizing. Yellow squash works great too. Zoodles are a great way to get more vegetables into your family’s diet! Here is a zoodles recipe that doesn’t require any special tools, just a vegetable peeler – Zucchini Ribbons with Pesto (vegan). Check out my pesto recipe – Mustard Greens Pesto (vegan).